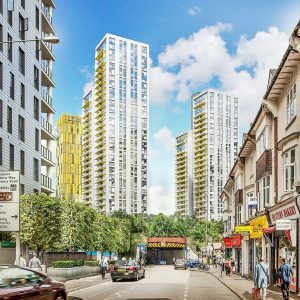 DEVELOPERS working on the £460 million redevelopment of Woking town centre have provided a view of the future with artists’ impressions of the Victoria Square complex as it will look from Guildford Road and Commercial Way. The image along Guildford Road, on a lovely sunny day with very light traffic, shows the apartment and retails blocks towering over Victoria Arch. It provides a stark contrast to virtually the same view in a photograph taken almost exactly 100 years ago. 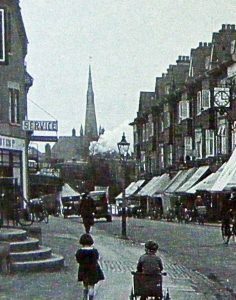 In the 1920s view, a steam train is passing over the railway bridge and the church spire dominates the skyline. WOKING TRANSFORMATION: The £460 million redevelopment of Woking Town Centre is officially under way, kick-starting a major regeneration project which will create hundreds of jobs and spearhead a new era of investment. Delivered by Victoria Square Woking Limited (VSWL), the project is a joint venture between Moyallen, which owns Peacocks Shopping Centre, and Woking Borough Council. A flagship Marks & Spencer store and a new Hilton hotel are planned, as well as new residential apartments and public spaces. Building and engineering firm Sir Robert McAlpine is now on site and has advanced preparatory site-clearing works to start construction of the iconic retail and residential Victoria Square development. The other angle indicates that the modern buildings will blend in with the rest of the recent work on Commercial Way. Provided all the work is finished on schedule, this will be how Woking will look in 2020 with more than 125,000 sq ft of new retail floor space added as well as 429 build-to-rent residential apartments, multi-storey car parking, a medical centre and two public plazas. With the demolition of Globe House and old fire station now complete, the site is being prepared for the main building work. Cllr David Bittleston, Leader of Woking Borough Council, said: “After several years of careful discussion, planning and consideration, I’m delighted to witness the start of Woking town centre’s transformation as Sir Robert McAlpine’s team move on site and get to work on a major project which will deliver real benefits.